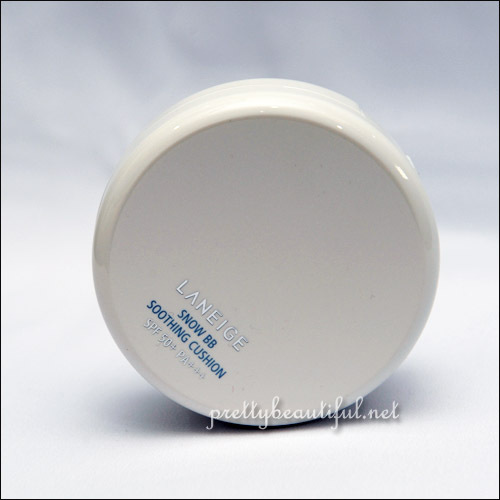 Recently, Laneige has launched a new foundation called Snow BB Soothing Cushion. 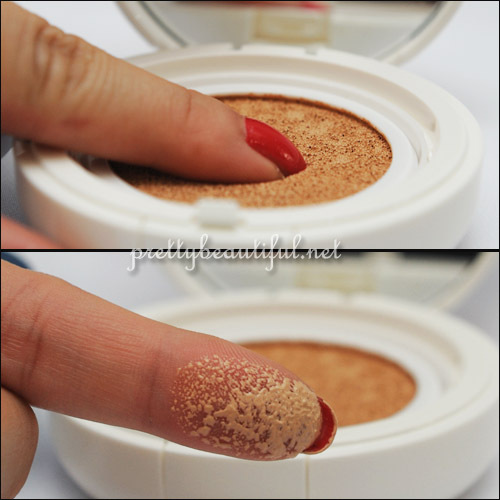 The packaging looks like a compact powder, but truth is – it is not! It’s actually liquid foundation in a compact! 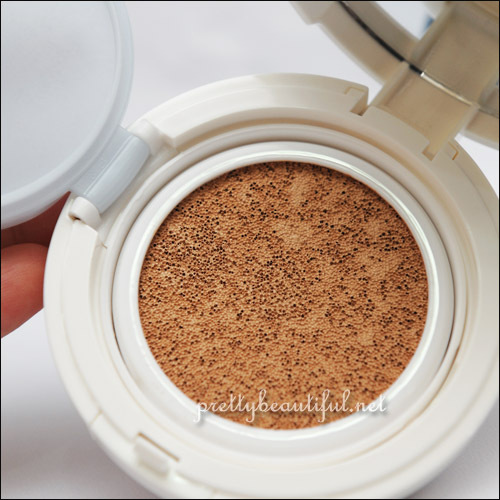 Laneige Snow BB Soothing Cushion is a unique BB with advanced formulation to help women freshen up quickly and providing protection for the skin under the hot blazing sun. Among some of its unique functions are brightening and whitening effects on the skin, sun protection with SPF 50+ PA+++, providing a refreshing and cooling sensation, evening out skin tone, and gives a longer lasting makeup. 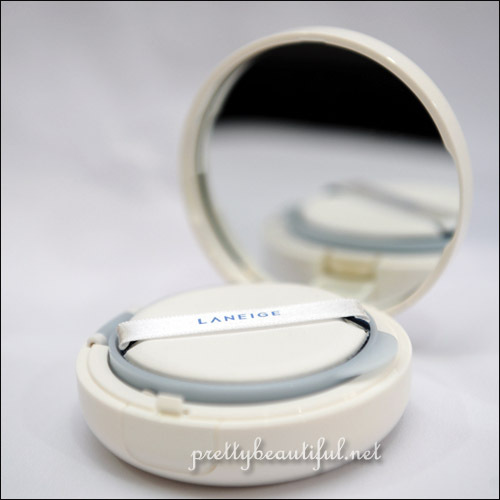 Comes in a cute sponge and full size mirror, it’s still not too thick to be slipped into your handbag or makeup pouch. Once you flip open the lid, be ready to be surprised by the look of it! I had to admit that I was disgusted by the look of it, erm, foundation, seriously? It looks almost like the sponge for stamps in post office to me! Once you press your finger down the sponge, you will immediately understand the logic of it – which is a sponge soaked with liquid foundation! Awesome! 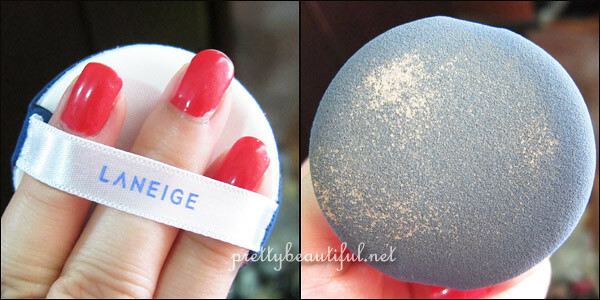 I like the design of the sponge, it’s in dark blue, and it doesn’t soak up your foundation as the pores on the sponge are tiny. It’s easy to use and the wastage is minimal. I actually love how the foundation look on me! The coverage is almost perfect with just single layer, and it leaves a cooling sensation on your skin within the first minute of application. Best part is – it stays on almost the entire day plus a lunch walk under the sun!!! 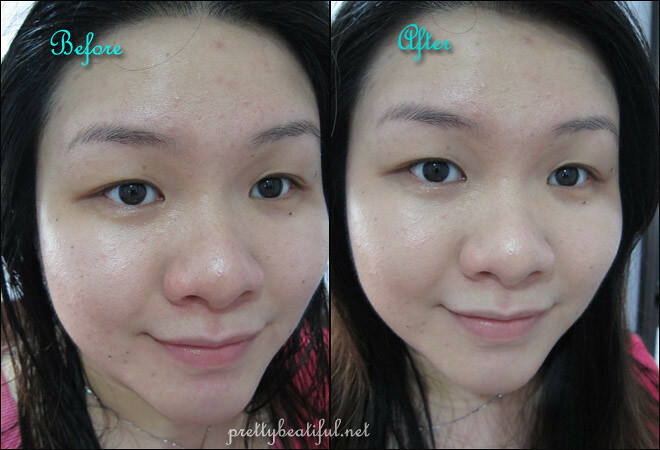 I have combination skin, and I usually have to retouch with compact powder again after lunch. However with this Snow BB Soothing Cushion, my foundation lasts for the entire 10 working hours 😉 And it helps blusher to stay on too 😀 Mega plus point for me! Overall, I am really liking this foundation, it is easy to use, good coverage, and awesome staying power! The downside is, like all Laneige foundation, it has this fragrance that I don’t fancy, it’s especially strong once you apply, luckily it disappears pretty quickly so if I am liking the result, I am willing to sacrifice my nose for a while. I am not sure how long a compact will last, it might dry up if you leave it unused for too long. And also, it only comes in 3 shades, it looks dark in the pan, but once applied, it evens out. Gently massage in lukewarm water with neutral detergent or puff cleanser to wash. Rinse thoroughly until the detergent is washed away, squeeze out moisture and dry completely in cool, dry place. Shades: Natural Beige, Sand Beige, Brown Beige. Paris B recently posted..Your Say: Are Beauty Bloggers supposed to be all young and/or beautiful? I agree with PB! It looks super dark on pan, I was thinking: “How in the hell will the color match Xin?” Wow! Very unique and coverage is indeed good! beetrice recently posted..Fancy fish eggs on your nails? It looks really awful in the pan, but really great on you! The coverage looks good too. It looks really great on you! You’re right about how it looks in the pan though – a bit geli haha. yeah it almost put me off till one day when i decided to just try it 😉 i am glad i did! looks good on you! very fresh and don’t seem like you had anything on! The mousse looks a bit iffy but man, look at that coverage! Next post: Feeling Lucky with Dior Addict Extreme Lipstick and Vernis in Lucky – For Work or Play!